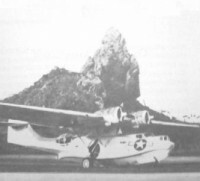 15 May 1943: After 15 days leave, VB-107 was reformed at NAS Norfolk, Va., as a bombing squadron Shortly after its arrival, on 15 May 1943, the squadron was redesignated VB-107 and subsequently ended its career as a medium seaplane squadron. 15 May 1943: After 15 days leave, VB-107 was reformed at NAS Norfolk, Va., as a bombing squadron flying the Army version of the B-24D Liberator (redesignated PB4Y-1 by the Navy). During the training period, the squadron came under the operational control of FAW-5. Within a week of reforming its personnel and assets, the squadron was relocated in sections to NAAS Elizabeth City, and MCAS Cherry Point, N.C., for intensive ground and flight training on the new Consolidated bombers. 15 Jun–5 Jul 1943: The first division of six VB-107 aircraft departed NAS Norfolk for Natal, Brazil, followed on the 20th by the remainder of the squadron. By 27 June 1943, all of the squadron aircraft were on board at Natal, with the squadron coming under the operational control of FAW-16. 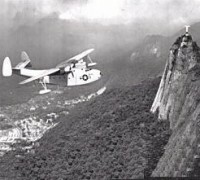 The squadron became operational on 5 July 1943 and began anti shipping sweeps in designated convoy lanes off the coast of Brazil. 12 Jul 1943: Lieutenant Tobin made a night attack on a surfaced U-boat without result. 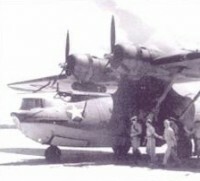 In the melee the PB4Y-1 was damaged by the submarine’s accurate AA fire, forcing it to return to base on three engines. 23 Jul 1943: Lieutenant (jg) Waugh, flying 107-B-6, attacked a surfaced U-boat in conjunction with Lieutenant Ford, sinking the submarine. Waugh’s aircraft apparently sustained damage during the attack, plunging into the sea after his bombing pass, all hands were lost. The submarine’s identity was confirmed by survivors of U-598,Kapitänleutnant Gottfried Holtorf commanding. 12 Aug 1943: Squadron commanding officer Lieutenant Commander B. G. Prueher departed Natal at 0800 with an extra-heavy load of fuel, intended for a protracted search of an area of suspected U-boat operations. Three surfaced U-boats were attacked in the afternoon. Subsequent testimony of German naval personnel captured at a later date indicated that Lieutenant Commander Prueher’s aircraft was shot down by the combined AA of the submarines during his second bombing pass. 30 Sep–1 Dec 1943: A squadron detachment deployed to Ascension Island to maintain barrier air patrols and sweeps between Africa and Brazil. By 1 December 1943, the squadron’s mission was shifted to barrier patrols in the South Atlantic narrows to intercept blockade runners. 5 Nov 1943: A VB-107 aircraft from the Ascension Island detachment piloted by Lieutenant Baldwin attacked U-848, Korvettenkapitän Wilhelm Rollmann commanding, in conjunction with two other squadron aircraft. Lieutenant Baldwin damaged the submarine sufficiently to prevent it from submerging. 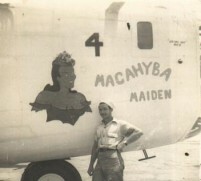 Lieutenant S. K. Taylor’s aircraft administered the coup de grace, hitting the target on both bomb runs, causing it to blow up and sink within five minutes. 25 Nov 1943: A VB-107 aircraft attacked U-849, Kapitänleutnant Heinz-Otto Schultze commanding. The sinking was confirmed by postwar review of enemy records. 1–2 Jan 1944: A VB-107 aircraft, 107-B-9, flown by Lieutenant M. G. Taylor, was on barrier patrol when he spotted a suspicious transport ship. When challenged, the ship opened fire with its AA, knocking out the number three engine and injuring the ordnance man. Lieutenant Taylor returned safely to Ascension Island as other squadron aircraft arrived on the scene to maintain contact with the ship. On 2 January a second VB-107 aircraft, 107-B-12, flown by Lieutenant Robert T. Johnson, attacked the blockade runner that had damaged Lieutenant Taylor’s aircraft. The ship opened fire, causing minor damage to the aircraft. Lieutenant Johnson elected to remain on station until relieved. The plane ditched en route to base after three engines were lost. None of the crew were recovered. Squadron aircraft stayed on station until Somers (DD 381) arrived to sink the vessel by gunfire. The ship was the SS Weserland headed for Germany with a load of crude rubber from the Far East. 6 Feb 1944: A VB-107 aircraft piloted by Lieutenant (jg) C. I. Purnell made two successful bomb runs on U-177, Korvettenkapitän Heinz Buchholz commanding. The sinking was confirmed by postwar review of enemy records. 14 Mar 1944: Research Company, retrofitted all Navy PB4Y-1 Liberator bombers at Litchfield Park, Ariz. Tail turrets of the same design were mounted as standard equipment on the PB2Y Coronado. Army versions of the J-model Liberator were equipped with the Emerson nose ball turret. 29 Sep 1944: Two VB-107 aircraft flown by Lieutenants E. A. Krug and J. T. Burton made a coordinated attack on U-863, Kapitänleutnant Dietrich von der Esch commanding. The sinking was confirmed by postwar review of enemy records. 10 Jan–4 Jun 1945: ComAirLant directed that VPB- 107 be redeployed from Natal, Brazil, to Dunkswell, England, to assist the Coastal Command of the RAF in the battles against the U-boats in the English Channel and Irish Sea.